Turn your smartphone into a virtual reality headset with ZEISS VR ONE smartphone trays. These precision trays hold your smartphone in precisely the right position and guaranteeing the best mobile VR experience. With Limitless Possibilities With the VR ONE, the smartphone you carry in your pocket can take you to worlds of virtual and augmented reality. With already hundreds of apps available on Google Play and AppleApp Store made for mobile VR devices you can simply download and launch the app, lock your smartphone in the VR ONE precision tray and slide it in the VR ONE. Experience VR games, videos, and amazing experiences that were never before possible. The Zeiss VR ONE delivers an unrivalled viewing experience with Zeiss precision lenses and the 5.2 inch display of the Galaxy s6 providing stunning and engaging visuals at a mobile-leading resolution. With the VR ONE, the effect is the equivalent of sitting in the best seat of a theatre, being on-stage at a performance with full 360 degree 3D video, and being able to enjoy gaming like never before - inside stunning worlds where imagination becomes reality. Apple's industry leading display technology and cutting-edge Carl Zeiss / Oculus-driven technologies fuse to create an experience that surprises and delights - all on a mobile device! 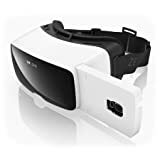 Glasses compatible Specially designed, the Zeiss VR ONE can be used with eyeglasses, so virtual reality can be enjoyed be even more people in total comfort. Designed specifically for the Galaxy s6 The VR ONE works perfectly with the Samsung Galaxy s6's software and holds the phone securely at all times in the specially fitted tray. There is also a host of applications and games in development. There is no lag between moving your head and moving the picture as the latency is excellent indeed at practically zero, or near enough so the difference is virtually imperceptible. 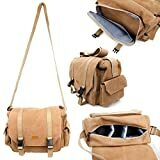 Introducing DURAGADGET's brand new and exclusive, premium quality, light brown canvas carry-bag for your VR Headset and all of its accessories. Made from a tough and durable canvas material, this bag is water-repellent and perfect to take with you whilst braving the elements to keep your Headset and accessories safe and organised. The main pocket of our bag is fully lined and has a removable padded section, offering three compartments that are separated with padded, adjustable, Velcro dividers. This not only keeps the body of your camera safe and separate from your accessories, but also provides the ultimate shock-proof protection. Customise this bag to suit your own individual needs - the removable interior compartments and can be adjusted to fit a DSLR camera body, lenses and other important camera accessories. The front zipped pocket is also lined with a soft, padded nylon material - capable of safely storing an iPad or other small gadgets whilst on the go. The additional two side pockets, secured with Velcro, offer spaces to keep your smartphone or other useful accessories / gadgets close to hand. For comfort on the go, this bag has a durable and adjustable shoulder strap to keep your expensive gadgets close to your person - whilst also offering completely hand-free use. Any devices shown in our images are for display purposes only. Zeiss Vr ONE iPhone 6 Virtual Reality Headset with Precision Tray for iPhone 6 ! 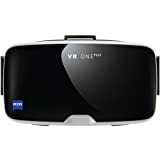 Zeiss VR One plus. Virtual Reality Smartphone Headset and Headset Tray for your iPhone 6 , 6s and 6s plus. Combine the two with smartphone apps like the VR One Media Launcher, available separately, to experience virtual reality videos and games. Additionally, the VR One can be used as a First-Person View (FPV) device with select drones by downloading apps, such as Cloudlight FPV or Litchi, that stream footage from your drone's built-in camera to your VR One headset, effectively putting you into the cockpit to see what your drone sees.Journey to new worlds with the VR One Virtual Reality Smartphone Headset from Zeiss. This headset combines with your smartphone to give you access to immersive 3D videos, games, and augmented reality. A wide variety of apps, such as the VR One Media Launcher, are compatible with the headset. Enjoy virtual reality on your iPhone 6/6s with the Zeiss Smartphone Tray for VR ONE. Simply place your smartphone into the tray and slide it into your Zeiss VR ONE headset to start your virtual reality experience. 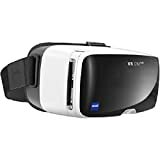 Zeiss Vr ONE for iPhone 6 ,6S , 6S PLUS Virtual Reality Headset with Precision Tray for iPhone 6 , 6S , 6S PLUS! Product Description Zeiss VR One plus. Virtual Reality Smartphone Headset and Headset Tray for your iPhone 6 , 6s and 6s plus. Combine the two with smartphone apps like the VR One Media Launcher, available separately, to experience virtual reality videos and games. Additionally, the VR One can be used as a First-Person View (FPV) device with select drones by downloading apps, such as Cloudlight FPV or Litchi, that stream footage from your drone's built-in camera to your VR One headset, effectively putting you into the cockpit to see what your drone sees.Journey to new worlds with the VR One Virtual Reality Smartphone Headset from Zeiss. This headset combines with your smartphone to give you access to immersive 3D videos, games, and augmented reality. A wide variety of apps, such as the VR One Media Launcher, are compatible with the headset. Enjoy virtual reality on your iPhone 6/6s with the Zeiss Smartphone Tray for VR ONE. Simply place your smartphone into the tray and slide it into your Zeiss VR ONE headset to start your virtual reality experience. Journey to new worlds with the VR One Plus Virtual Reality Smartphone Headset from Zeiss. This headset works with your smartphone to give you access to immersive 3D videos, games, and augmented reality. Just slip your smartphone into the custom-made tray, insert the tray into the VR One Plus, and you're ready to go. Thanks to its specially designed "eye-box," users don't have to make any mechanical lens adjustments to account for different interpupillary distances, meaning the VR One Plus can be worn with eyeglasses as well. Ventilation ports are built into the headset to prevent fogging, and openings in the smartphone tray allow you to hear your smartphone's audio clearly. Journey to new worlds with the VR One Virtual Reality Smartphone Headset from Zeiss. This headset combines with your smartphone to give you access to immersive 3D videos, games, and augmented reality. Just slip your compatible smartphone into its custom-made tray (available separately) and insert the tray into the VR One, and you're ready to go. The VR One can be worn with eyeglasses, and it has ventilation ports to prevent fogging on the Zeiss lenses. A wide variety of apps, such as the VR One Media Launcher, are compatible with the headset. Additionally, the VR One can be used as a First-Person View (FPV) device with select drones by downloading apps, such as Cloudlight FPV or Litchi, that stream footage from your drone's built-in camera to your VR One headset, effectively putting you into the cockpit to see what your drone sees. Take Flight with Zeiss VR One The Zeiss VR One takes advantage of smartphone/app technology to enable First-Person View (FPV) from your drone. FPV puts you in the cockpit and lets you see exactly what your drone sees. Compatibility The VR One is compatible with 4.7 to 5.2" phones and requires the use of VR One smartphone trays. VR One trays are sold separately for select mobile devices.